Hey everyone! 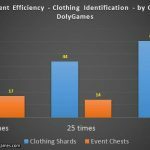 In this article I share the calculation / analysis for Wartune’s Clothing Refinement Event to help clearly understand returns and rewards. This is a Daily Event which has had a duration of 3 days since it was launched. 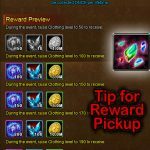 DESC = During the event, use Clothing Refinement Stones to receive rewards. Note: the table above includes rounded numbers. So using 350 stones and exchanging chests into stones results in getting 189 stones back, which is a 54% return (roughly half). This can also be done at the 200 per day level with the same 54% return, but I do not recommend lower tiers are due to much lower rewards return rate. What if I want to have 100% of Stones? If you have around 200 or 350 stones you might decide to make sure you get 200 or 350 back so that you can do this event every day for the 3 days duration. So that means we need to get the other 46% of stones from Event Chests which we earned elsewhere. Using 200: getting 107 in return according to the table above = need 94 more (they come by 2). 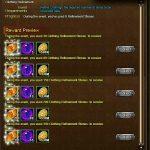 94 Clothing Refinement Stones = 47 Exchanges = 47 x 15 = 705 Event Mini Items or 71 Event Chests. Using 350: getting 189 in return according to the table above = need 162 more (they come by 2). 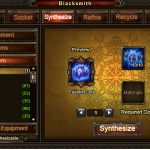 162 Clothing Refinement Stones = 81 Exchanges = 81 x 15 = 1215 Event Mini Items or 122 Event Chests. So if there is no interesting Exchange or Event for you to use your Event Chests on you can consider doing the above. However paying 71 or 122 Event Chests each day for 3 days is quite a heavy price. Were you aware of this possibility? Are you surprised or disappointed about the return amounts? Are you interested in Clothing Refining? 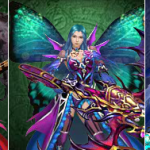 Do you think Wartune is doing a good job / game design with the Clothing Refining and Clothing Refinement Stones? and max 99 exchanges event chest for event mini item is possible in event week. Ty Cosmos providing these infos….